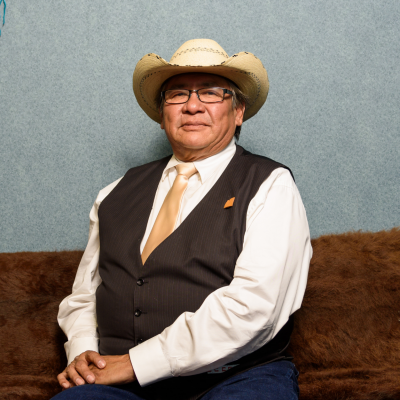 Xakiji Lee Crowchild is the third generation Xakiji following in the footsteps of his father, former Xakiji Gordon Crowchild and his grandfather, former Xakiji David Crowchild whom Crowchild Trail is named after. Having an extensive and varied educational background, Xakiji Crowchild has graduated from Washington State University ‘82 B.Sc.P.E with a focus on biomechanics and Exercise Physiology, the University of British Columbia ’99 Dipl. EDST, Diploma in Film at The Vancouver Film School ‘02, He started at Mount Royal (College) University, where he was asked to return as an instructor. He has worked in many capacities and positions within Tsuut’ina. This includes, Manager of Infrastructure, Director of Public Works, and Emergency Management for the Nation. Outside the Nation he has also held a wide-range of positions for various boards including APTN Board of Directors and the Chairman of Making Treaty 7 Cultural Society Board of Directors. Chief Lee Crowchild is a man of the people and knows that, “Serving the people – our people – requires diligence, sacrifice, and great earnestness”.